If you can’t take the heat, get in the water. Dallas is a hot city, but it’s definitely not a dry town. Although landlocked, when the cocktails start flowing and pools get popping, even the most scorching day will seem a bit cooler. 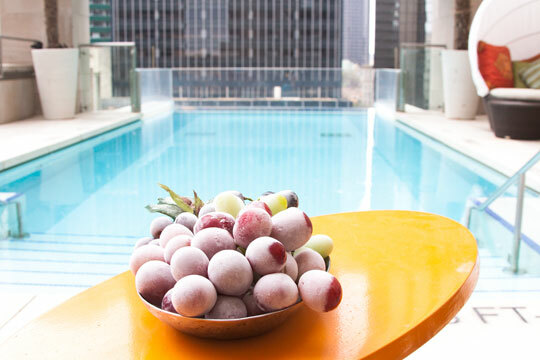 As the temps continue to climb, cope with the heat by taking a dip and having a sip at these pools. 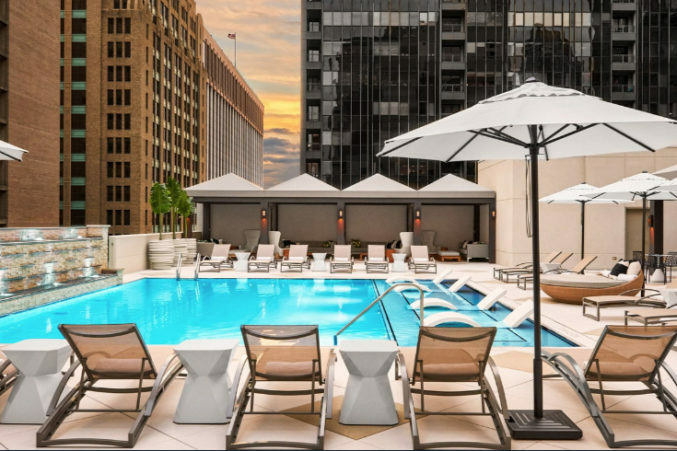 The scene: Through September, catch a movie on the hotel’s seventh floor pool deck. Each month’s movies will be from the same decade. July is dedicated to the best of the ’70s, August to the ’80s, and (you guessed it) September is dedicated to the ’90s. How to get in: Free and open to the public. What to drink: Your decision might change depending on the film. Luckily the poolside menu offers a little bit of everything. Hours and location: Every Wednesday at 8:30 p.m. 1321 Commerce St., 214-741-8200. The scene: The rooftop pool extends eight feet past the edge of the hotel. If the illusion of swimming beyond the building frightens you, the pool bar is there to help calm your nerves. 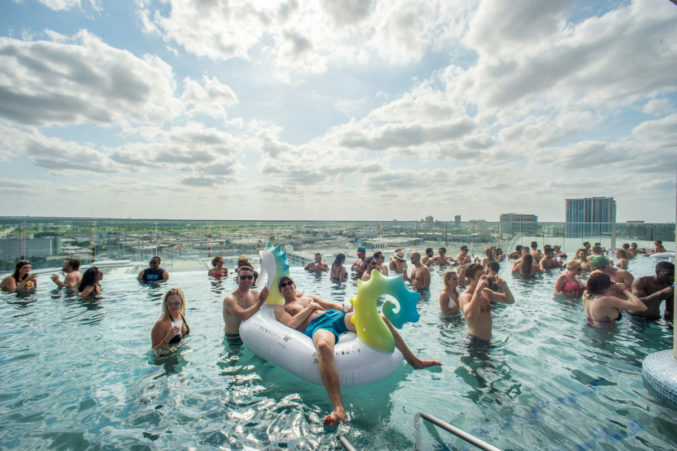 How to get in: One day pass is $50 per person and includes pool access, valet, one food item and one drink (or two food items and two drinks, depending on how you roll). Reservation required. What to drink: We recommend The Cure, made with charcoal vodka and Topo Chico. The jet black drink is as aesthetically pleasing as it is (somewhat) hydrating. Hours and location: The pool is open 10 a.m. to 10 p.m. and the bar is open 11 a.m. to 7 p.m. 1530 Main St., 214-748-1300. FOE. Photo by Jason Acton. 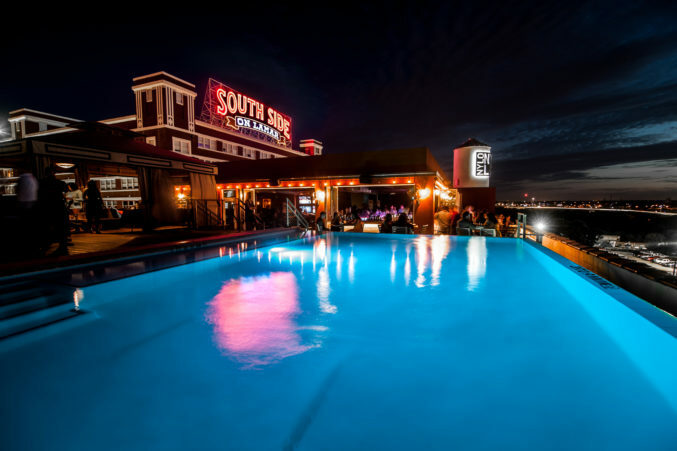 The scene: An Olympic-sized pool equipped with entertainment for the entire family (there’s volleyball courts, a kiddie pool, and most importantly, a bar). How to get in: Open to public for a cover charge. $10 general admission and $5 for kids 12 and under. What to drink: The fully stocked bar will serve up anything you want, but beer seems to be the most popular beverage option. Hours and location: Daily from noon to 9 p.m. and the bar is open until midnight. 8500 Arturo Dr., 214-327-9563. 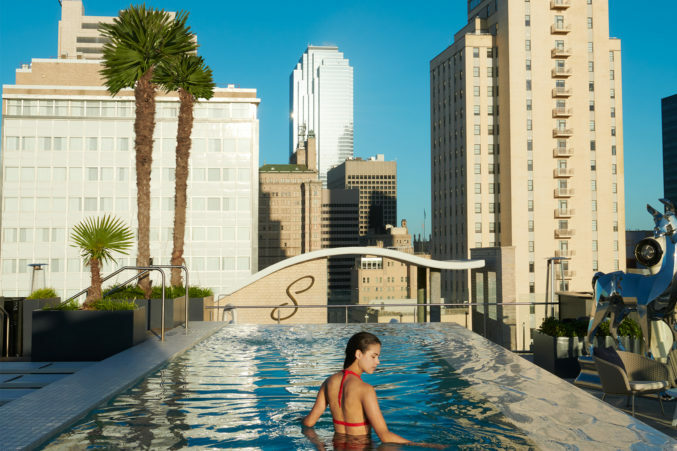 The scene: A chic pool on the 16th floor of the hotel which boasts a stunning view of downtown Dallas. How to get in: You have to be a guest of the hotel. What to drink: Try a specialty cocktail from the WET Deck menu. The W Mojito with mint infused rum, lime, sugar, and soda is a sure way to cool down. Hours and location: The pool is open sunup to sundown, and the bar is open 11 a.m. – 6 p.m. 2440 Victory Park Ln., 214-397-4100. 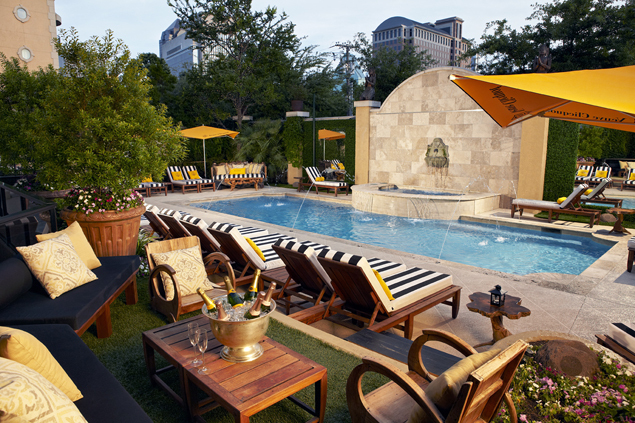 Photo provided by Hotel Zaza. The scene: An exclusive guest-only pool which hosts a variety of parties. How to get in: You have to be a guest of the hotel to use the pool, but the bar is open to the public. What to drink: The hotel’s poolside menu offers a selection of wine, cocktails, and adult popsicles. Feeling lavish? Order bottle service. How to get in: You must be a guest of the hotel during the day, but on Friday and Saturday nights the pool opens to the public. Hours and location: Daily 10 a.m. until 8 p.m.
What to drink: Sip on a martini or a gin and tonic. How to get in: Must be a guest to swim, but anybody can drink at the bar and hang out on the patio. What to drink: The Belleview martini made with vodka, St. Germain, and white cranberry juice. Hours and location: Bar is open Sunday through Thursday 3 p.m. to 11 p.m., Friday and Saturday 3 p.m. until 2 a.m. 1325 S Lamar St., 214-421-1080.